I made some simple but super delectable Kimchi Avocado Rolls last week, all thanks to a subpar experience at a restaurant. And it’s become my (new) favorite way to enjoy kimchi. Let me explain. A few weeks ago, I tried a kimchi roll (Gimchi Gimbap) at a restaurant at the urging of the server. He called it “fantastic” and “probably the most popular item” on the menu. You don’t have to twist my arm to try a kimchi dish, but I was a little trepidatious about trying it at a non-Korean restaurant. But we tried it anyway. I’ll say that the dish had a lot of potential. It, however, left me confused. The cabbage kimchi they used in the roll was beyond ripe, but they compounded the problem by adding vinegar to it. What?! Perfectly ripe kimchi will give you a light zing on your tongue, but it will not taste sour. And unless it’s “quick kimchi” you’d want to eat right away, vinegar is not added to cabbage kimchi. The fermentation process produces its own vinegar of sorts. So as soon as we got home, I decided to make my own version of it. 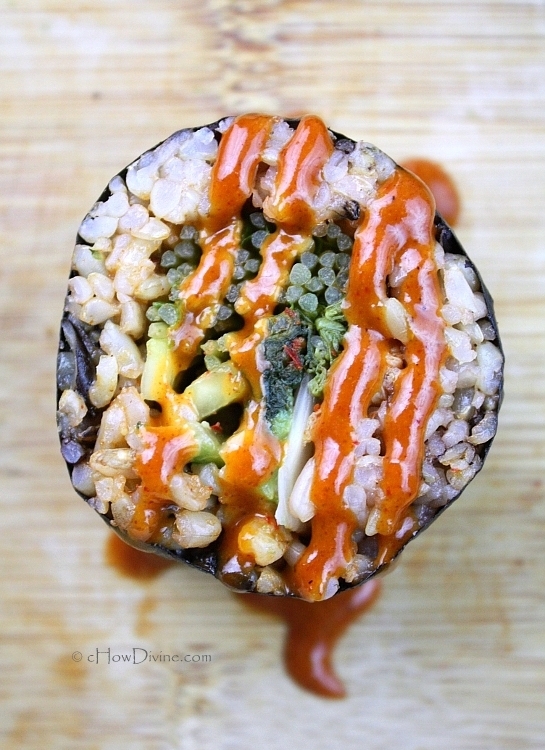 Kimchi rolls or Gimchi Gimbap are not uncommon in Korean households. After all, we (Koreans I mean) find ways to put kimchi in just about everything. We had some snow pea sprouts, cucumbers, and avocados in the fridge. They each go so well with kimchi. It worked out perfectly! I used a combination of wild rice, forbidden rice, brown rice, and brown sweet rice. But if you are a newbie to this, you should use sushi rice or short grain white rice. They are stickier in texture and much easier to roll. Additionally, if you don’t have snow pea sprouts (or just don’t like them), you can use other types or sprouts or omit them all together. To prepare the cashew-gochujang sauce, stir cashew butter, gochujang, agave, and rice vinegar in a small bowl. Set aside. Spread out the rice in a thin layer to let it cool until it’s comfortable to touch. While the rice is cooling prep the filling ingredients. Once cooled, mix the rice and the rest of the ingredients for the gimbap rice in a bowl. Mix gently being careful not to crush the rice. Place a piece of dried laver on a bamboo mat. Spread out 1/2 of the gimbap rice over 3/4 of the laver, leaving the 1/4 of the laver farthest from you empty. Place the filling ingredients in layers on the rice. Remember to leave about an inch of the sprouts (leafy part) hanging out. Try to stack the filling ingredients on top of one another. Roll away from you by pulling up on the edge of the bamboo mat closest to you, and folding the rice and laver over the filling. Squeeze and roll again creating a nice round cylinder, peeling back the bamboo mat as you roll. Roll tightly. You can “seal” the roll by brushing some sesame oil to the end of the laver. Repeat with rest of the rice and laver. Cut the gimbap into 1/2-3/4 inch pieces with a sharp knife. Wipe the knife as necessary with a paper towel soaked in some oil. Serve immediately with some spicy dipping sauce. I prefer the sauce with raw cashew or almond butter. But if you don’t have any on hand, you can use other nut butters. For gluten-free option, use gf sriracha instead of gochujang. Keep in mind that sriracha is spicier than most gochujang sold in stores. Start with about 1/2 tsp of sriracha and taste test. Additionally, if you decide to use sriracha, remember to decrease the amount of vinegar as sriracha contains vinegar. To keep this vegan, make sure your kimchi is vegan. Most kimchi sold in Korean markets is not vegan. But vegan kimchi is readily available at Whole Foods or other health food stores. I gave approximate amounts for the filling, because the amount will differ depending on your preference and skill level. I use A LOT (more than the 1/2 cup) of kimchi in this, but rolling the gimbap will be more difficult with increased filling. So if you are a newbie, start with a low filling to rice ratio. Once you are comfortable, you can increase the filling. You can adjust the amount to gochujang and agave depending on how your spice and sweet tolerance/preference. ….But you made it 10 times better and I am sure healthier than what they had to offer. Looks absolutely “divine”, Gomo! Tempting pictures as always! Thanks for sharing and have a wonderful weekend! Thanks Sandra! I think it was like going to a Chinese restaurant and ordering spaghetti. :) I should have known. But it did get to me make this, which is my favorite – new – way of eating kimchi! I hope you are well Sandra! Looks so good. Love kimchi and love avocados! I can’t imagine not loving this recipe. Thanks Miss Kim! Love them too. I can make a meal out of them anytime. As much as I love kimchi, I’m a semi-purist when it comes to desserts. I’m really adventurous when it comes to apps, mains, and sides, but not desserts. I want my dessert to taste like dessert. Cheese plate with nuts and sweet jam or chutney is as far as I would venture. So I think I will pass on the kimchi or gochujang stuffed pastries! Gosh, I’m learning a lot readying your blog! This looks so nice – and something I should try. Kimchi anything is fun, and this looks spectacular. Thanks. Thank you John! It’s a really fun way to enjoy kimchi. I hope you give it a try. Happy Sunday! Can I just come live with you for a while? I love your kimchi dishes and this Japanese / Korean fusion looks incredible! Love everything about it! You’re welcome at our home anytime MJ! Will you bring some of your chile sauces? 😀 Hope you had a lovely weekend! Thank you for your kind words Kumar! Excellent idea! 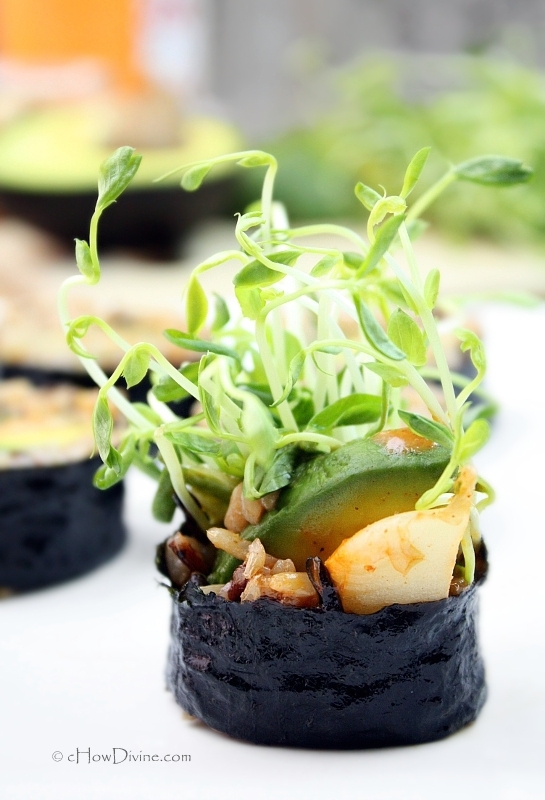 I am such a big kimchi fan and yet have never thought of putting kimchi into maki rolls! I am thrilled to learn another way to use kimchi. I would probably be as shocked as you were at the vinegar addition: I have now a 3 months’ old kimchi in my fridge and it’s too precious to be spoiled by vinegar! Thanks Sissi! I think Kimchi makes everything better! And it’s generally so good with toasted nori. Yeah, it was pretty weird. Maybe they thought the light sour taste that comes from fermentation is from vinegar. But thanks to them, I have a new favorite way to eat kimchi! My stomach responded to the pictures and growled. I love the combination of creamy avocado and spicy kimchi! What a healthy and scrumptious roll! Avocados are so good with everything! I’m obsessed with them. 🙂 Thanks for your kind words Nami!